We decided to approach this project as a collaborative mentorship, we called it Taping Spaces. Briony guided me through Tape It’s concepts and logistics. I spent a day at Art Play Melbourne to witness Tape It in motion and we had many phone calls and emails in the build up for the festival. We successfully applied for a Regional Arts Victoria Grant to help make this all happen. In my own practice I am interested in how we create the different spaces that we occupy- what are the ways in which we manage to create different environments from day to day or from person to person. This is where the collaboration kicked in. Fun4Kids is a 7 day festival. 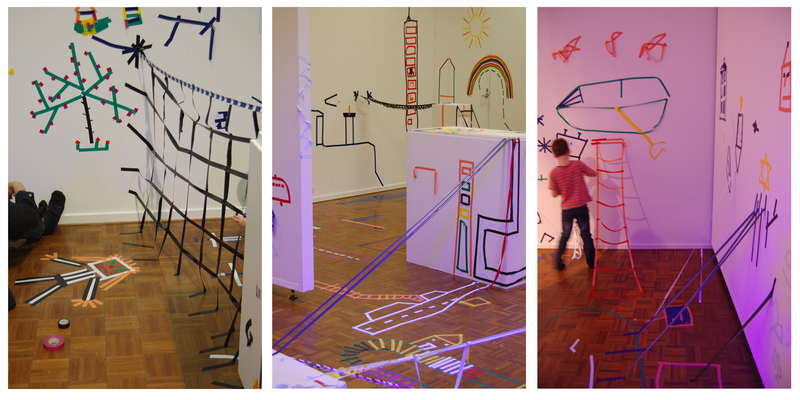 Taping Spaces was set-up in the large space that is the Warrnambool Art Gallery’s Temporary Exhibition Space. The festival director was keen to make sure each family visiting the festival had a different experience each day. To do this I ran a different drawing theme each day- The Rainforest, In the City, The Milky Way etc. I was also able to tweak physical aspects of the space- movable walls, rearranging display boxes, changing lighting (inc. UV Light & Spotters) and music. It was brilliant to be able to play with the space in these different ways over the course of the week. Most importantly people had a ball. Families would spend an hour and a half at a time, many came back to keep drawing over the course of the festival. It is this aspect of arts programing that I have really come to love- setting up situations that enable people, especially families, to interact with each other. Last year, Liza McCosh, Director of Scope Galleries, generously invited me to exhibit my video work “Gaia is Symbiosis as Seen from Space”. I took this as an opportunity to develop some of the thinking contained in the video as well as to further develop my installation processes. Inside Out marked an important step forward in my thinking about my specific research as well as my broader understanding of how art produces knowledge. I came to realise the extent to which this video work is very much in conversation with the work of colonial landscape painter Eugene von Guerard and his observations which sought to understand the landscape as an interconnected ecosystem. I also came to realise the important role art plays in not only observing and critiquing our relationship to the world but also how crucial it is in proposing new and alternate ways to imagine this relationship. I reworked my footage from “Gaia is Symbiosis (…)”, slowly it down and playing it from end to start so as to let the viewer work backwards back to the ground. I also set this footage to a very simple soundtrack, a recording of my washing machine as it works through a wash cycle, occasionally thumping as it spins itself off balance. The spinning footage and the sound of the washing machine were a perfect complement and worked to draw together the sense of the ordinary domestic with the sense of the “bigger picture”. 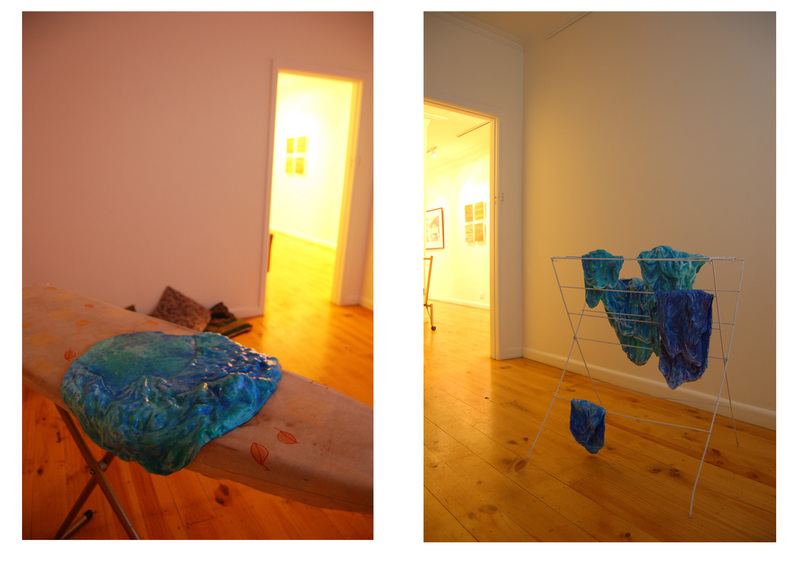 I made a series of sculptures that imitated water hung out on my clothes horse and my ironing board. As a happy coincidence the smell of the running data projector was almost identical to that of a hot iron. Through PhD research at the Australian National University Canberra I have been examining the overlap of body and environment as an “aesthetic subjectivity”. This way of understanding subjectivity emphasises how embodied consciousness is embedded in and emergent from its environment- an environment that we primarily experience aesthetically as the combination of sensation, emotion and meaning. A creative practice led inquiry into my domestic environment has centered this research. From this point I have attempted to make sense of and plot my relationship to the larger world in which I exist. 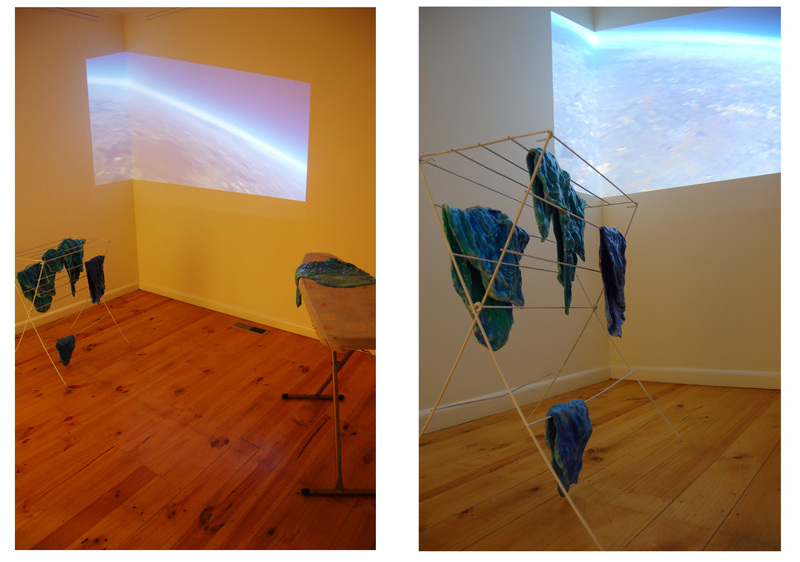 I have used photography, drawing, sculpture, written reflection and sound and video recording in this continuous observation of my relationship to space. Inside Out is a fragment of a larger body of practice that reinterprets my 2013 video work Gaia is Symbiosis as Seen from Space in order to imagine continuity between our ordinary domestic world and the larger social, ecological and cosmological realities we share. Focusing on the aesthetic nature of our connection to the world has provided me with a way to imagine the materiality of our continuum with time and space. My aim now is to create spaces that convey this to others. The video Gaia is Symbiosis as Seen from Space was originally created as part of “The Kitchen Table Art Expedition”, an Arts Victoria Artists In Schools Program held at Macarthur Primary School in 2013. During May and June 2014 I began work on this piece. 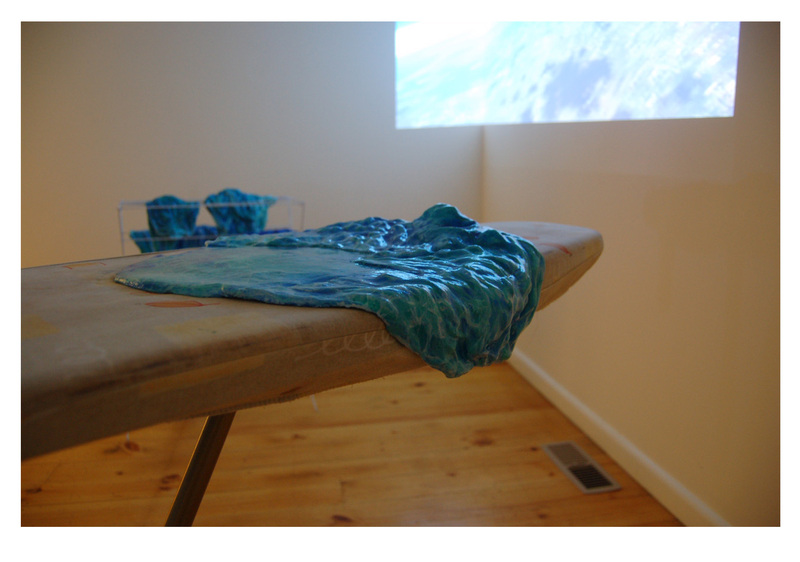 It is a transition from the smaller sculptures and drawings that marked the middle of my Practice-led PhD Research. 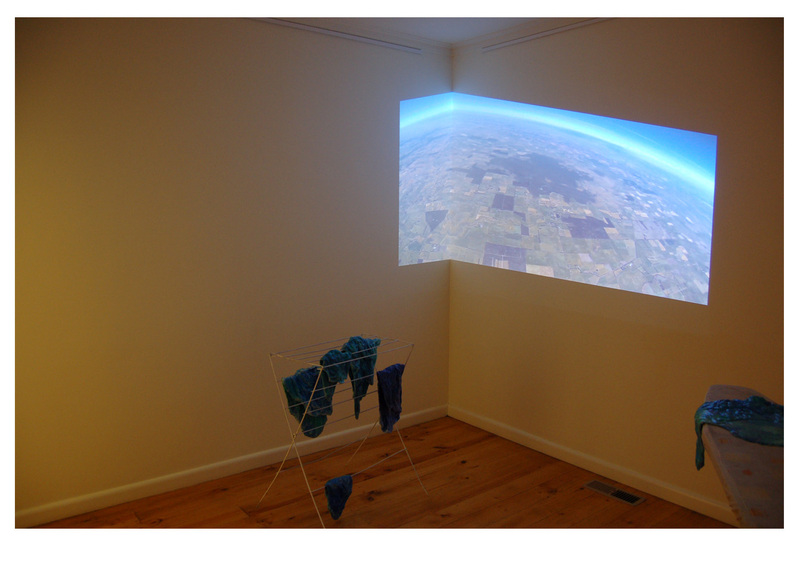 With this work I was concerned to communicate the feeling of space that emerged through my domestic observations. A bathroom basin was replaced in our humble home and I seized it as an opportunity to push my work into installation thinking. I constructed a timber frame and had mirrors cut to fit it- the glazier reported that it was especially difficult to oval for the basin but he did well. I created a very low tech system that allows me to take the mirrors on and off as the work is presented. I fashioned faux water using plaster and acrylic paint. Small speakers are embedded in the external water form and beneath the drain. A laptop, amplifier and subwoofer were put inside the mirror box to power these speakers and two larger speakers placed further away from the sculpture inside the exhibition space. The sounds of brushing teeth and washing hands can first be heard coming from basin, these are gradually intertwined with spoken word and a guitar piece composed by my partner Dean. These sounds are then picked up and extended on the second set of speakers that sit away from the sculpture. This interplay of sounds across distance works to fill the space in a really interesting way. The volume increases on the second set of speakers until it fills the room with the sound of an ocean wave crashing. This work was presented at the Artery in Warrnambool, a retired funeral home that has been converted in a gallery, retail shop and artist studios by the local arts co-op “The F-Project”. I was privileged to be the first artist to create an installation just for this small section at the rear of their gallery, it is a peculiar light well that, from local reports, provided natural light for the viewing of the deceased. 2014 and was such a busy year for me! One of my highlights was having my video “Gaia is Symbiosis as Seen From Space” included in Warrnambool’s Silver Ball Film Festival. 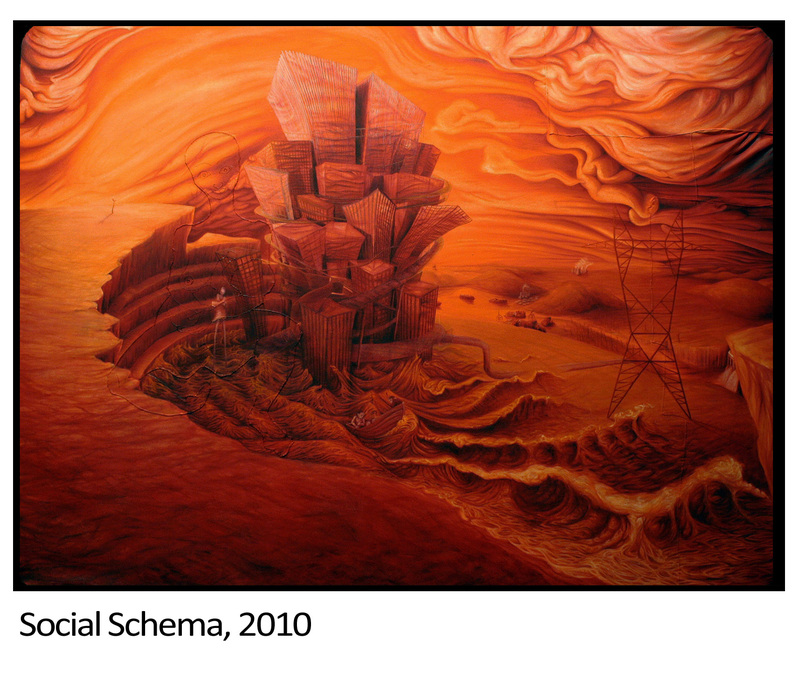 (Venture further down my blog posts to find out more about this video & its role in Artists In Schools 2013). My video is currently posted on a kind friends Vimeo channel & you can check it out by following the link above- rather than the “arty” version, it is the “brief-story-of-how-it-happened” version, its a lot of fun but it might make you dizzy!! The Silver Ball Film Festival was held outdoors in and amongst Warrnambool’s laneways last May. It was staffed by numerous devoted arts people in Charlie Chapman kit. It was a freezing yet spectacular night you can read more about it below. This image should be floating around as a free art card in Warrnambool anytime soon. I was still breastfeeding my 9 month old son when I began this painting in 2009. I embroidered a maternal figure, nursing her infant into the canvas after I stretched it. The frame is the base off our old queen size bed, the canvas gathers in the corners and the are sections where the fabric buckles and pulls. This painting had lingered in my imagination for years, when I undertook my Bachelor of Arts Honours through Deakin University I allowed it to finally come through. I used this Honours year (or year & a I/2 in my case) to examine questions that had perplexed me for sometime- all around the relationship between our internal and external experiences of reality. Was it possible that the external world was somehow a reflection of our internal self-consciousness, perhaps our unconscious too? This research lead me to investigate the history of “substance dualism” best known as the mind-body split and to trace the history of this dualism through Western intellectual traditions and practices. Having recently borne my third child my own maternal body and contemporary Western culture and medicine became a nucleus for this inquiry. That period of research was rich and formative, it produced the notion of aesthetic subjectivity which drives my current practice led research. I made a number of sculptures, abstract paintings, a video and this painting which all became the womblike installation space Maternal Interstice. I have always found it frustrating to be a passive witness of news, of world trauma and global changes. I also cringe at the phrase “as a mother” which is mostly used as a qualifier for nappies and paracetamol. This painting, Social Schema, is the confluence of those two: as a mother passively witnessing world trauma. It was influence by my deep reaction to the Little Children Are Sacred Report in 2006, the on-going anxiety, frustration and grief I feel regarding our destruction of the environment, Australian media’s and politics’ misconstrued representation of asylum seekers. This painting was produced over about twelve months, I drew from Australian artist’s Jeffry Smart and James Gleeson as influences and “as a mother” I found it significant to be referencing great Australian, male painters. I grappled with a lot of questions through the making of this image, parts were challenging technically and this was often mirrored on a philosophical level. I probably began this work from the basis of an “us” & “them”, I was critical of how “they” were screwing up my world- gouging it out in open cut mines, shipping meaningless consumer items across oceans, starving ecosystems and filling the atmosphere with that contentious, choking gas. The on-going wrestle and dance persisted on the canvas and in my body, in my muscles and nerves: how many items in my home were once afloat on the ocean, how much CO2 had I put in the air on behalf of my precious babies? This painting became a process of accepting that interfolding between body and world; it gave me an insight into the complexity of this interfolding- we overlap our world views and realities building the familial, communal, socio-political, global, perhaps even spiritual spaces that become “the world”. Many ideas germinated through my honours year- this inquiry into the co-productive relationship between space and consciousness has become quite loud in my current work….